Did you celebrate World Sparrow Day on 20 March? It bothers me when I read that these birds are becoming extinct in Indian cities. Chirpy, cheeky little sparrows were part of our life, growing up as children in a dilapidated Kolkata flat. They nested high up in an old-fashioned ventilator. And caused us kids some heartbreak when the babies fell down or when one flew into the whirling ceiling fan and was injured. We’d try to save the babies, placing them tenderly in a cardboard shoe-box padded with soft rags or cottonwool. Invariably they died. And if they survived, they were rejected by the clan because human handling had made them suspect. Or so we were told. As the sparrow project websites point out, everyone weeps for the tiger, the rhino and the elephant. Not many people know, though, that the humble house sparrow is endangered. So it is heart-warming to read about the attempts in different parts of the world to bring them back. 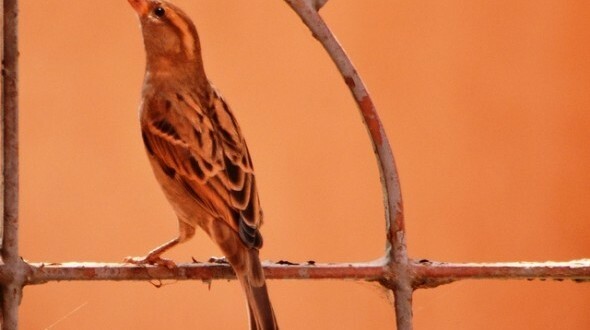 In several Indian cities, there are groups of sparrow lovers, working to spread the message about the threats to the species and to engage families to start little colonies on their verandahs and balconies. An art project was launched to save the sparrow, too. The rediff.com website offered this astonishing information. It also noted that a subsequent Chinese famine was in part caused by the elimination of sparrows, which naturally prey on a variety of insects harmful to crops. According to the report, Mao Zedong held rats, flies, mosquitoes and sparrows responsible for the failure of the 1957 grain harvest. He ordered the massacre of 1.96 billion sparrows between March and November 1958, despite the objection of experts that sparrows were in fact the major defence of the grain fields against insects. The killing culminated on 13 December 1958, when Shanghai residents reportedly destroyed 194,432 sparrows. Encouraging children to go on a bird-killing spree may also have had a dreadful effect on their sensitivity and naturally gentle instincts. Previous: A voice from the hearts of brothels..